Life becomes busy and you bustle from one thing to another and many times you forget to stop and appreciate the wonderful people in your life. I made a point to remember those special people this year and surprised a few friends with a bit of joy on their doorstep. I picked up some sweaters at the thrift store and felted them in order to create a few fall crafts I had in mind. I traced the shapes of leaves and then on the sewing machine stitched the veins on each leaf. 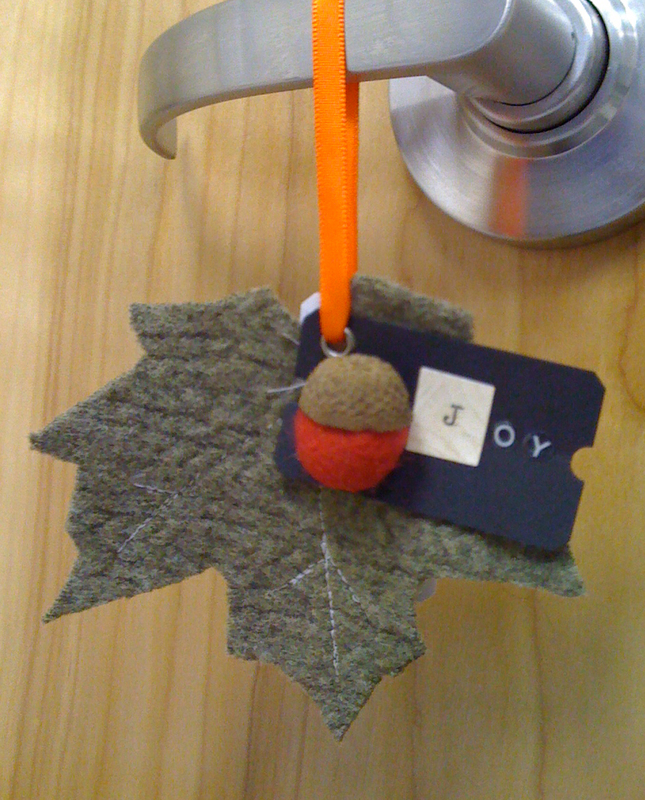 Adding a felted ball with an acorn top along with a simple note thanking each person for being in my life. Here are the directions I used in order to create the felted balls. Take a moment today and spread your own Joy, tell the people you love that you appreciate them. Thank you for coming here and reading my words, your comments mean so very much to me. You are so talented and a joy to follow. We will be with lots of family today, eating way too much and having fun. Hope your day will be just as great. Happy thanksgiving Odie! Thanks for commenting!